About a third of all of the brides and grooms that we work with request an arch or a Chuppah as a central element for their wedding ceremony. There are so many ways to add florals and decor to your ceremony including florals with pillars, columns, urns, wine barrels, petals and pew posies. 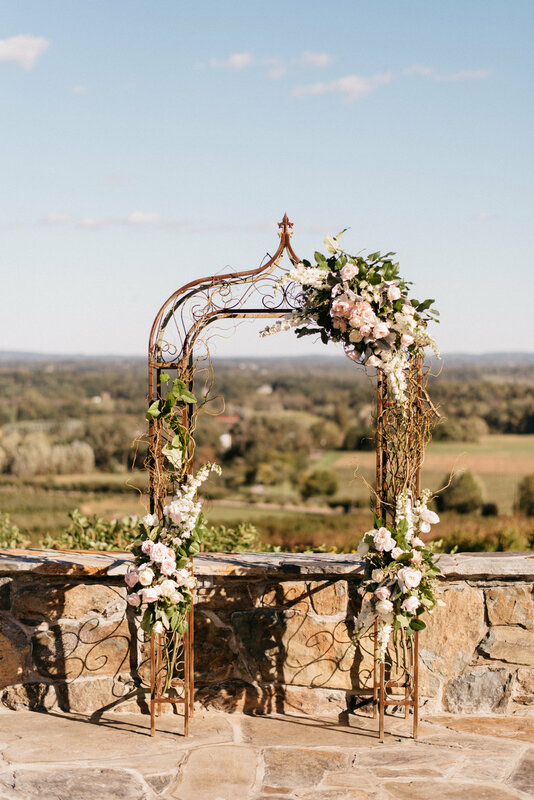 An arch or similar focal structure raises the level of the flowers and creates a central setting for the ceremony; a place for the officiant and bridal party to gather. In effect, an arch is meant to represent an altar when a wedding ceremony is being held outside. A Chuppah has deep religious significance and according to Wikipedia "symbolizes the home that the couple will build together." Loudoun County, in Northern Virginia, boasts some of the most beautiful outdoor wedding venues in the Mid-Atlantic. From wineries and farms to historic inns and resorts, natural outdoor settings for weddings abound in this beautiful countryside. You can let the hillsides frame your wedding ceremony, or you can add a significant focal structure. You will find that many venues have an arch on site, or you can rent one from your floral company. There are ways quite a few ways to approach the design of your arch or Chuppah. Your considerations may be based on your personal style and theme, your budget, or both. Full floral arch with Peonies, Hydrangea and Garden Roses at Stone Tower Winery. Photography by Candice Adelle. A full floral arch or Chuppah is dazzling. A full arch, by our definition, has florals on the entire front side of the structure from nearly the ground up. When we design a full arch, we prep the flowers and greens in the studio and then transport them in water and preservative to the venue. One to two stylists will add cages (foam floral holders) to the entire structure and begin by "greening in" the cages. The foam provides a source of moisture for the greens and flowers, extending their beauty and protecting them from wilt. After greening, our designers add flowers to the arch using the same principles they use when arranging in a vase -- creating balance with color and texture while emphasizing key focal points. The process of hand-crafting a full floral arch on site can take 1 1/2 to 2 hours. Partial Arch at Rust Manor, Photography by Beth T. Photography. There are two methods that we use to create a partial arch or Chuppah. We can attach floral cages when we get to the site, adding greenery and flowers just like we would with the full floral arch. Or, we can create "bundles" of florals in cages in the studio ahead of time. We attach the bundles to the structure when we arrive, supplementing with greenery and flowers in water tubes as needed. The hand-crafted partial arch allows us to design as we go, guided by the shape of the arch and its surroundings. The flower cages designed in the studio work well when we have limited time for set-up or when we are working with one of our own arches. Partial arch with branches at Bluemont Vineyard. Photography by Chris Glenn. Greenery-only decor continues to be popular, especially on focal structures like an arch or Chuppah. The greenery can be made to be very lush, full and drapey. While there are some greens like Jasmine that can be a little more expensive, in general, greenery-only aches can be more affordable. We like to work with no more than three to four different varieties of greenery. Greeneries begin to look busy if there is too much going on. Branches add fantastic texture and movement to an arch. A partial arch can look fuller simply by adding branches. You can use your theme flowers on your arch and tie together every element of your wedding. However, you don't have to use all of your theme flowers, or, any at all, if you are working with some of the luxury stems. There are, for example, standard Rose varieties that mimic the unstructured center of a Garden Rose for a third of the price. However, your arch or Chuppah will be up for close inspection from you and your bridal party. If you want to see Peonies, then by all means, let's use Peonies. A beautiful arch with your theme colors will make for some timeless photography. This Chuppah structure also serves as an arch. Floral tie-backs at the Salamander Resort and Spa. Photography by Eli Turner. A Chuppah is most often draped as part of Jewish custom (though not necessarily all of it). Last fall, a bride at Stone Tower Winery asked us to include a family heirloom as part of their Tallit -- the portion of the cloth that covers the top of the four poles. We used our own draping but attached the antique, embroidered material to the underside. Some brides choose to weave the draping around the poles leaving the top exposed. Others love the idea of floral tie-backs like the ones shown in this picture. Draping is not limited to Chuppahs. We can create an elegant effect that looks very "bridal" by wrapping fabric around the poles of an arch. Arches are considered a major floral element with a wide-range of pricing based on the complexity of the design. If you are using an arch at your venue, then you will only be paying your florist for the flowers and labor. We usually suggest that the price of a partial arch on-site begins at around $300. If you are renting an arch, your florist will bring the arch to your venue, set it up and stylize it during the hours leading up to your wedding. You will learn more about the prices for different types of rentals and florals during your consultation. We work with all kinds of flowers including but not limited to Hydrangea, Sunflowers, Roses, Peonies, Dahlias, Snapdragons and Stock. Hydrangea adds fullness while Snapdragons add whimsy and movement. Greeneries add texture, drapey-ness and depth. 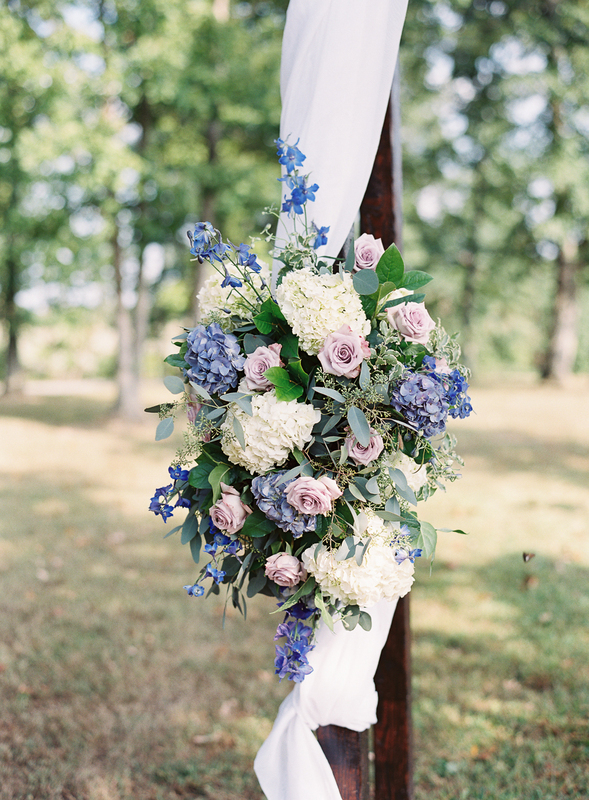 We can talk about your favorite flowers and how to incorporate them during your consultation. You can further adorn your arch with lanterns around the base or floral arrangements on pedestals nestled nearby. Many of these arrangements can and will be repurposed for your ceremony.